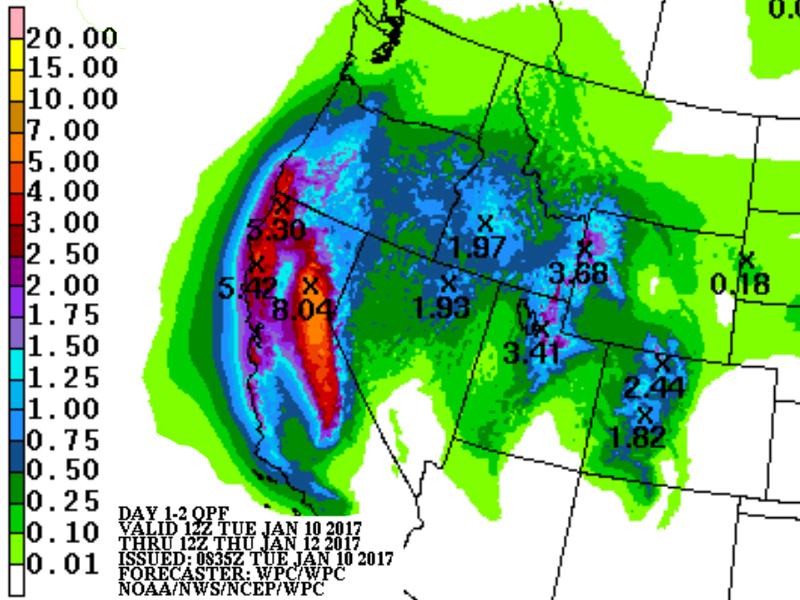 Parts of California have already received 6-8 inches of rain. That number is expected to double (or more) today and Wednesday. This occurs when high pressure bubbles up off the west coast of Canada and forces the jet stream farther south than usual. The jet stream then moves just north of Hawaii and travels east-northeast and brings plentiful tropical moisture to the entire West Coast of the United States. Pineapple Express patterns have been responsible for many major floods in the west, and the current situation is no exception. Flood watches and warnings have been in effect across the northern half of California, southwest Oregon and even parts of northern Nevada for the last few days now. 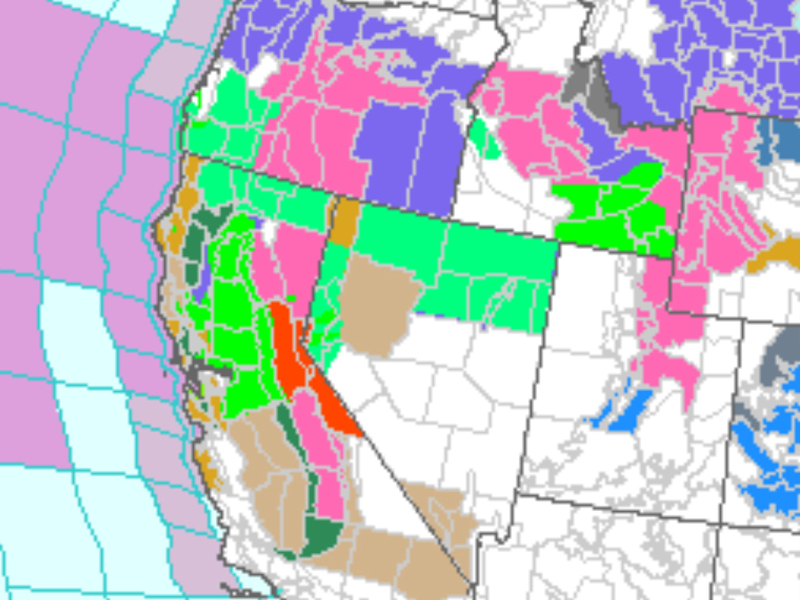 In higher elevations, Winter Storm Warnings have been issued, calling for feet of snow. Several rivers have already reached flood stage, and they're expected to keep rising throughout the next couple of days. A famous tree has been destroyed because of the current storms and flooding. While the rain is being measured in inches, the Sierra Mountains and other higher elevations are measuring snow in feet. While flooding, mudslides and impassable, snow-covered roads are making life difficult in the Golden State, all of the precipitation is good news for the long-lasting drought. 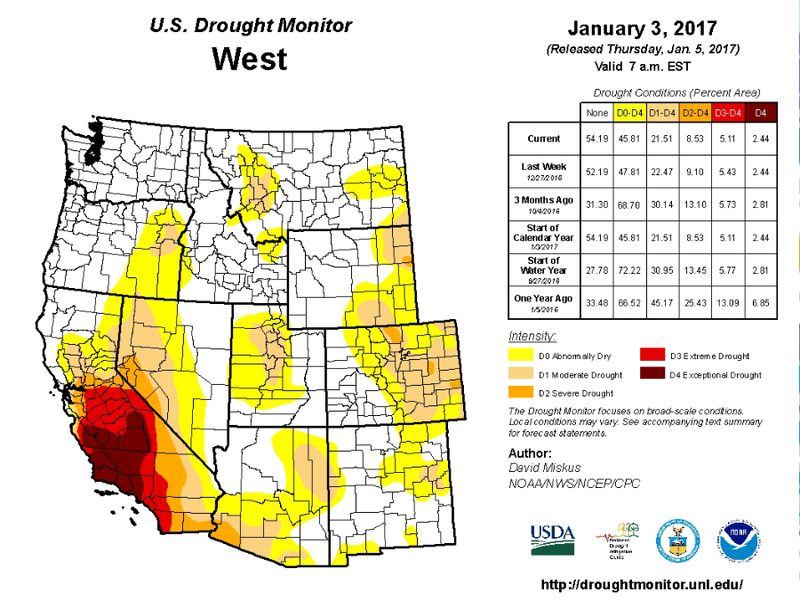 The northern half of the state was already seeing diminishing drought conditions while severe drought persisted in the south. The rain and snow should help to alleviate, if not eliminate the drought across most of the state. This particularly wet pattern should wind down near the end of the week with drier conditions moving returning to most of California on Friday and Saturday.